This marks 3000 posts for me. I've really enjoyed all my time here at Tau Online the past year and half and I'm really looking forward to the next 3000 posts. When I first started here I was just getting back into 40k after a two and half year break and had never played 4th edition! My Tau were brand new and barely started, a barely realized concept. Now I've learned a lot about the game, and my army from this site, and most importantly the people on it. Everyone here is helpful kind and courteous, I've never seen an online environment that is more welcoming. In particular I think it has to do with our fantastic admin and moderation team and I'd like to take a moment to thank them. In particular I'd like to thank Yriel for his insightful and very well reasoned tactical articles. Khanaris for his ability to be everywhere and always offer a kind word and helpful tip. Finally I'd like to thank our now retired but brilliant Inquisitor Lord, MalveuX, he writes novels instead of posts, but he never wastes a word. In an attempt to give back something to Tau Online I'm writing a guide to tournaments. People talk about them a lot and make many lists for them, but as for the actual events them selves you don't hear much. Anyways enough rambling, without further ado I give you�. We've all heard of them and we all have a very different idea of what exactly they entail. I'm sure everyone has had or heard of many good and bad experiences when attending one. This is a quick step by step guide on how to prepare for one and what to do on the day when you show up to play. Your army, you'll certainly need this to play in a tournament. Firstly you'll have to make a list. It is fairly crucial you make something good here. Some people complain about"Cheese"and"beardy"armies. Don't worry though, it's a tournament don't feel bad about pulling out all the stops. People are attending in the hopes of having some good and challenging games, don't disappoint them by brining a sub par army list! That said there are some things to consider. Firstly is there going to be a composition score at this tournament? If so how does it work? Most tournaments will have a score based on your army composition, and part or all of this value will come from those you play against. Some things you should do to make sure you don't lose points unnecessarily. 1 - Find out if there are any army list requirements for the event you are attending. For example in Canadian Hall of Heroes tournaments you get 1 point per round provided you spent 30% or more of your points on troops. In a full 5 round tournament that can make a very large difference in your final score! 2 - THEME! Its ok to take a powerful army list, but make sure it has a theme. It means your opponent will understand better why you made the choices you did, and it is often more visually appealing. A theme need not be complicated, but as long as there's something present. For example a devastator company of space marines, or mechanized Tau force are both very nasty lists to face, but are very characterful and well themed. Alternatively a 6 scout squad blood angels army with two masters of sanctity is obviously not themed, but instead built solely to maximize the death company. 3 - FUN! Build a list that you like, and will have fun with. If you hate staying still don't bring 6 broadsides, 12 sniper drones and 2 squads of pathfinders. Make sure your list is something you're familiar and comfortable with and that you enjoy using it. However equally, if not more importantly make sure that your list is fun for your opponent! Don't make it easy, but at least make it something that relies on cunning and skill to use. Anyone can bring a siren bomb and 9 times out of 10 it will scissor vs. paper, but every now and then it will meet rock. Either way only one player is having fun that game. Ok now you've got your army listed selected, and maybe even have a few practice games under your belt. The next question is presentation. Nearly all tournaments, especially larger ones require painted models, and quite rightly so! The players are paying a fee to be there playing, and putting effort into their armies, return the courtesy to your opponent and make sure your forces are painted. I know not everyone is the greatest painter; I myself am not that skilled. Don't worry about it. Choose a colour scheme you like, paint your army consistently and base everything and it will look good. Picking something striking and unique will impress people and they will complement your army. 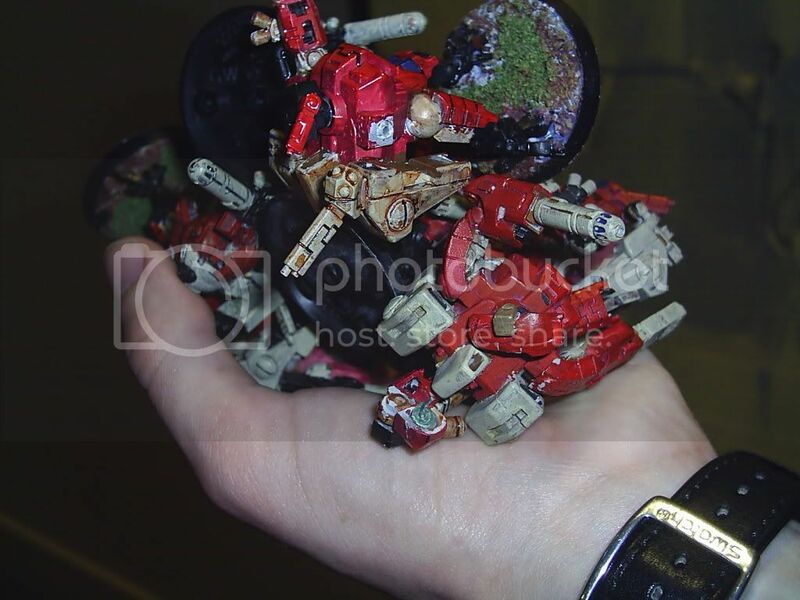 Amusing anecdote: At a tournament a couple weeks ago I brought my red and bone Mech Tau army (see left). They were resplendent in their colours, with six skimmer tanks lined up and ready to fight. A couple tables over there was a mechanized Eldar army, it also included six skimmer tanks, all painted in red and bone. Great minds think alike I guess! Now you have an army list, it's all painted and based. You're ready to go play in a tournament. I've found the GW Definition: Games Workshopwebsite is very good for finding tournaments in Canada. I don't know exactly what it's like for other countries web sites though. Once you've found one though I'd recommended giving the organizers a call or sending them an email if you're not familiar with the venue. It's very easy to fall into the trap of thinking all gaming places are like your local hang out. This isn't true! When you contact the organizers first you should let them know that you wish to attend, and make sure there's still space available. If they are running low on space make sure you reserve a spot for yourself. While you're talking to them ask what their tables are like. How big are they? How much terrain do they typically have? What sort of terrain is it? I remember the worst tournament I ever went to. It was a store in Oshawa, I'd never been there so I took a gamble and decided to attend. I didn't ask before hand what the play space was like. I showed up expecting standard 6'x 4' tables with 25% covered in terrain. Much to my surprise what I was greeted with was 4'x 4' tables with almost no terrain! Like 2-3 pieces per board. Your army - You'll need this, it's pretty obvious. I'd suggest a carrying case of some sort for ease of transport. Typed army lists - at least two copies, one for yourself, 1 for the organizers. Sometimes I'll bring a couple extra copies in case any of my opponents want to keep one. Typed army background - This is requirement for some events, but even if its not bring one along. It'll make your army more interesting and after reading it an opponent might give you a better comp score. Once you've done this once you probably won't have to change it for future events, well worth spending a minute to write something up. Dice, templates & measuring tape - I don't need to explain what these are for and why you need them. A display base - This is sort of optional. I know I personally don't have one, but it certainly can be handy for moving your models around once you're there. This can be something basic like an old cork board or something as complex and detailed as a fully modeled, themed and painted base for your force. Food - Some events provide lunch/dinner. If this is not included bring some food or snacks with you. There's not always a convenient fast food place close by the store or hall where the tournament is taking place and it's hard to play on an empty stomach. Glue - To make any emergency repairs, both super glue and polystyrene cement are a good idea. Directions - If you've never been to the location before don't forget your directions! Include the address and phone number in case your directions get you lost. Check in with the organizer and make sure you're signed up. This is the point where you'll have to pay at most events so have your cash ready to go! Most events allow an hour for registration; make sure you get there at least half an hour before the actual gaming is scheduled to start. Once you're registered you can relax for a moment and grab a coffee. Take some time to meet some of the other players and look at other armies. If you have a display base now's a great time to take your force out and set it up. Be nice to everyone and try to get a feel for what the event and location is like. Keep your eyes open for anyone you know, you never know who will turn up at a tournament! There's been a lot written about gaming here at Tau Online. I'll just say this about tournament play. Be nice, be courteous, and don't be argumentative. Play by the rules and point feel free to point out if your opponent is doing something wrong. Above all try to relax and have fun, joke with those you play with and don't be shy. I can always tell who's having the best game by which table is making the most noise! Get excited, jump up and down, and yell! But at no point should you stop paying attention to the game, stay attentive and keep thinking.